The Experience: Nestled along the James River in the shadows of the city skyline, you’ll find this local favorite that was pleasing palates long before the recent Downtown Lynchburg restaurant boom. Founded in 2004, The Depot Grille literally lives up to its name. Sitting within a stone’s throw of the front doors are active railroad tracks, and two freight cars were converted into the restaurant’s kitchen, seen through the back windows of the dining room. You’ll find other historic, salvaged items inside, including the bar (from a pharmacy in Edinburg, Va.) and church pew booth seats (from a church in Pennsylvania). 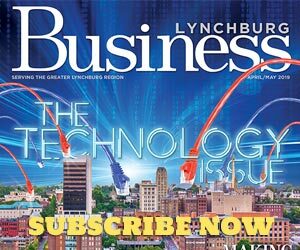 Brush up on your Lynchburg history and its ties to the railroad, and you will have a great icebreaker conversation with a new client or potential colleague. Poole says their Chicken Tender Salad or Batter Fried Chicken Tenders are popular choices for lunch guests. Their Bison Burger is also a favorite. But don’t stop reading if meat isn’t really your thing. The Depot Grille has a range of options for vegetarians such as their tofu sandwich and black bean burger. “Our menu is so broad, there is something for everyone,” says Poole. 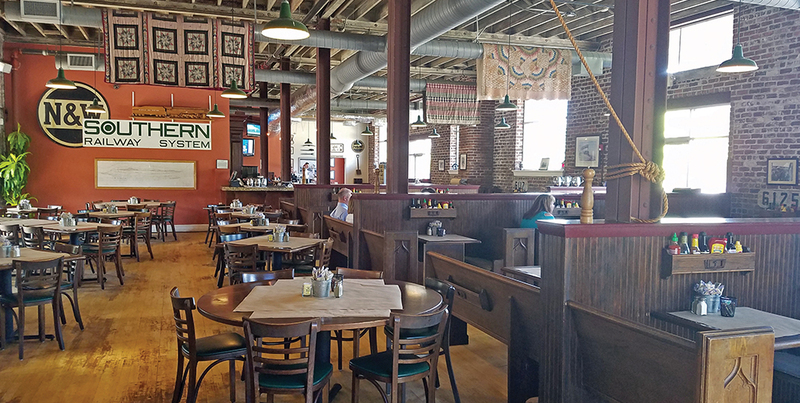 The Extras: Aside from The Depot Grille’s history and food, Poole is proud to offer a range of seating options for the lunch break crowd. “We have the more intimate booths that are great for a quiet meeting between a client and accountant, for example. But we also have the board-room style tables that seat six or eight people for a casual lunch out for a group of co-workers,” says Poole. And if you want even more privacy for a business meeting, check out The Depot Grille’s side room. It seats a maximum of 12 people, and there is no charge for the room as long as you and your guests eat a meal while you are there.